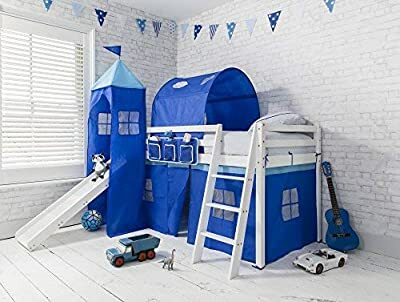 Our clever and compact Blue cabin bed with it's very own Slide is perfect for giving your children a safe and sturdy sleep space, as well as the space to hide all their toys away in. Combining a quality solid wood mid sleeper with a secret hide-away underneath, this bed is the perfect place to play whilst providing ample storage for tidying away your little one's clutter. A real winner among children and parents! Solid pine midsleeper Cabin bed with Play Tent in a Solid White finish. 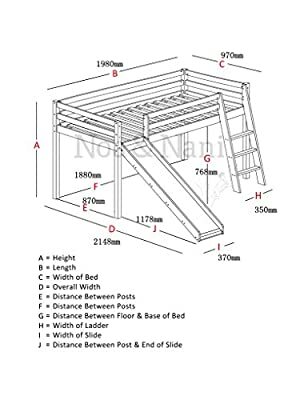 Dimensions: 101cm (Width) X 202cm (Length) X 114cm (Height) size of bed (not including Slide) Tower, Tunnel , Tent and Slide Included; Please ensure the phone number on the order details is up to date for delivery purposes This items come Flat Packed for Delivery Unfortunately due to the size of the item we are unable to ship to Scottish Highlands or Islands, the Channel Islands or Northern Ireland. If you are unsure please contact us.